The Crystal blue Caribbean Sea surround you as you lay in a hammock and the soothing sun sets over the horizon. A lullaby of waves softly caressing the ashore and gentle trade-winds rustling nearby palm fronds ease you into absolute relaxation. No need to rush, the only important decision to make is whether to have your meal served at your hammock on the end of your personal dock, at a secluded spot on the beach or in the comfort of your villa. 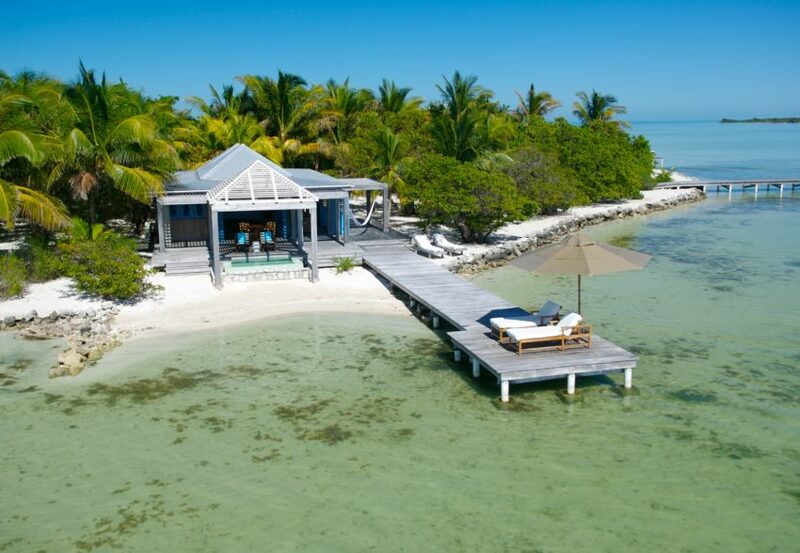 Cayo Espanto, a private island paradise, combines the ultimate in luxury and seclusion. We invite you to spend enchanting evenings and unforgettable days overlooking the caribbean while our staff attends to every detail. 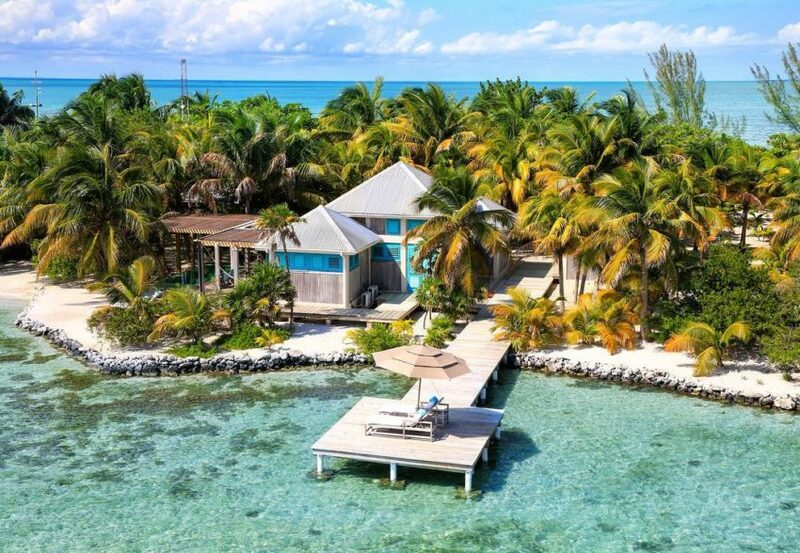 Although less than two hours from Miami, Dallas, Atlanta and Houston, Belize Remains virtually undiscovered. 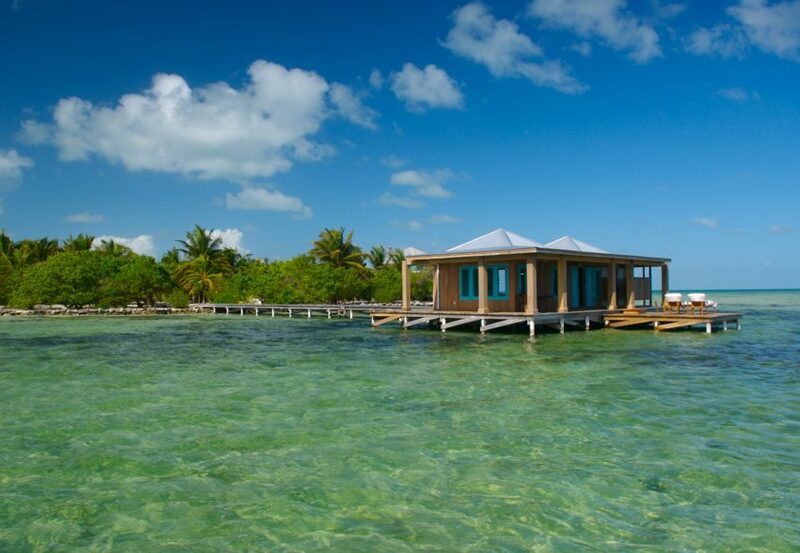 Cayo Espanto is an exclusive resort for the discriminating few who demand the best that life has to offer. Restaurant: World Class Cuisine- A new menu is created daily to perfectly suit your tastes, based on a survey you are asked to fill out before you even arrive on the island. Indulge yourself in our exquisite two-story, two bedroom ocean-front grand villa. Gaze at the sparkling Caribbean from the remarkable second-story view from your second story view; or at the end of one of two private docks. Your upstairs master bedroom has an open-air design, hardwood floors, two balconies with incredible sunrise and sunset views and private bath. Downstairs guests will be busy appreciating a 360 degree view of the Caribbean, with doors on all sides opening directly to the Sea. This villa is clearly distinguishable by its grand size. Casa Estrella also features a personal plunge pool, alfresco showers, and king size beds dressed in Egyptian cotton linens. The downstairs bedroom can be furnished with two twin beds upon request. 2600+ square feet. Casa Aurora’s layout allows you to relax without boundaries. This comfortable villa is perfect for that romantic getaway and has a large private plunge pool (the largest on the island), and fantastic morning views from your private dock. Guests can enjoy serene moments in a hammock, or bundle up in the king beds, covered in Yves De Lormes sheets. Enjoy Caribbean ocean side bedrooms, with sleek baths and personal decks and private dock. The center of Casa Aurora has a living room with a butler’s pantry that opens to the deck and covered pool area. This feature leads to a two-level deck, which connects your living area with your infinity plunge pool, private dock and beach areas. This is one of the best aspects of Casa Aurora. During the day your Houseman can move your living room outdoors poolside. This is truly one of the best spots on the island. Casa Aurora is adorned with exotic hardwood furniture and does have the capability of sleeping four guests if you need a little extra room. This is the island owners favorite house! 2100+ square feet. Casa Olita will charm you with it’s sophistication and seclusion. Relax on your private dock, take a dip in your personal infinity plunge pool or cool off in your alfresco showers. It’s your choice. Toast your honeymoon or simply embrace your loved one in the enchanting walled garden. Other luxurious touches include, a king size bed dressed in Egyptian cotton linens, Zericote and Jobillo wood furnishings and mosquito netting. Casa Olita will treat you to spectacular sunset vistas from inside your villa, your infinity plunge pool, private dock and beach areas. 1500+ square feet. Enjoy the best natural breeze on the island in Casa Brisa. Soothe your mind and your body in your personal infinity plunge pool, located on your private verandah, or take some time to soak up the spectacular Caribbean vistas from your wrap-around deck and private dock. Choose between a pair of twin beds or one king bed in your secluded hideaway; which also features exquisite Egyptian cotton linens, cabbage bark ceilings, romantic mosquito netting and alfresco showers. 1200+ square feet. Seize the day in this majestic ocean-front villa, complete with private dock, personal infinity plunge pool and refreshing alfresco showers. Bask in the royal treatment that you deserve. Casa Manana’s king size bed dressed in Egyptian cotton linens and positioned in the center of the villa, is surrounded by romantic mosquito netting and a panoramic view of the Caribbean. Other indulgent features include granite counter tops and exotic hardwood cabinets. Casa Manana will treat you to spectacular sunset vistas from inside your villa, your infinity plunge pool, private dock and beach areas. 1500+ square feet. Our one bedroom, ocean-front, sunset bungalow, Casa Solana is secluded on the western tip of our island, allowing guests to bask in the warm glow of Cayo Espantos best sunsets. 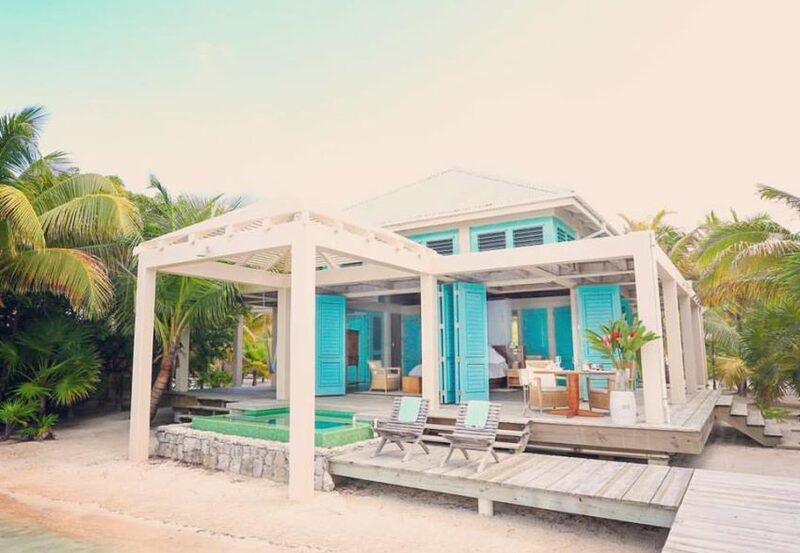 This bungalow’s distinctive Caribbean architecture and chic island decor creates a refreshing and relaxing atmosphere for guests to unwind with an expansive verandah, separate dining area, and private infinity plunge pool. 1500+ square feet. Our one bedroom, over-the-water bungalow is designed in the same style as all of our other villas, thoughtfully appointed with every imaginable comfort, custom-crafted furnishings and amenities. 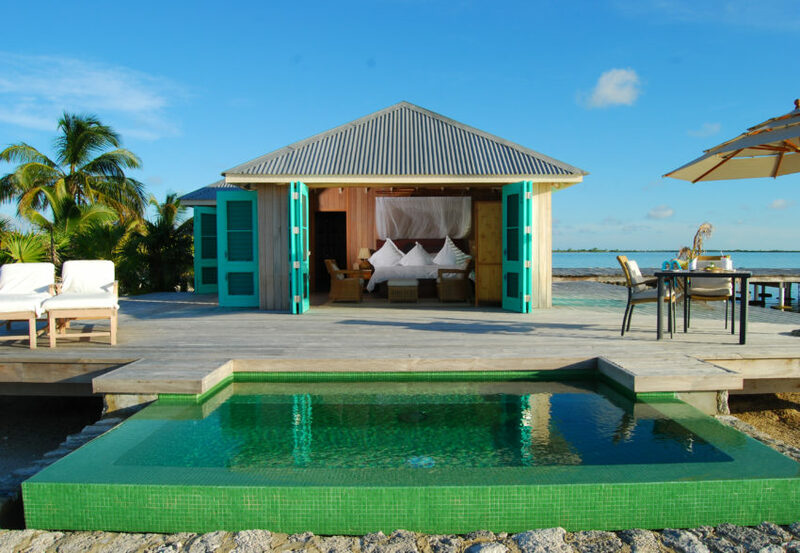 This unique bungalow is the most intimate, romantic and requested accommodation on the island. Casa Ventanas is situated on the island’s main dock, which stretches over 150 feet off the island for the ultimate in privacy. Surrounded on all sides by the beautiful, turquoise blue Caribbean Sea, Casa Ventanas now features a glass floor section, which is a picture perfect window into the exotic water world of Belize. Guests are always enchanted by all of the sea life swimming right past or under their bungalow. 1100+ square feet. 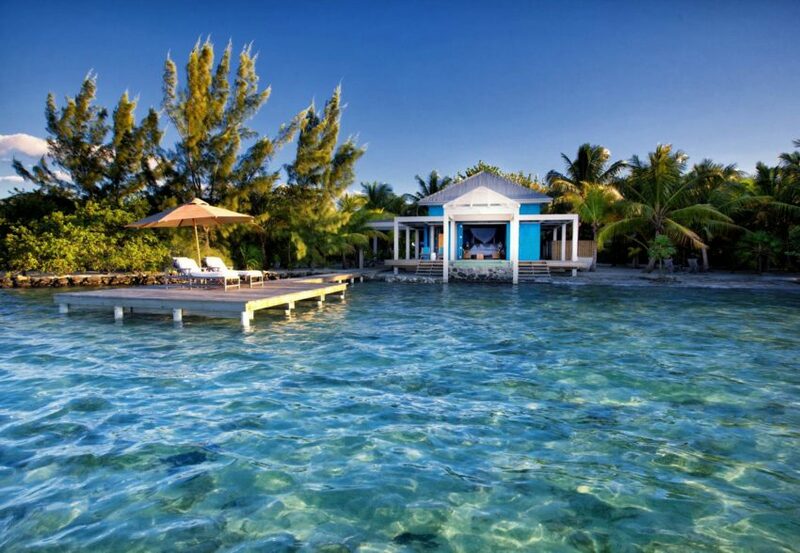 Experience the primal mystique of renting your own private island; having water 360 degrees around you. 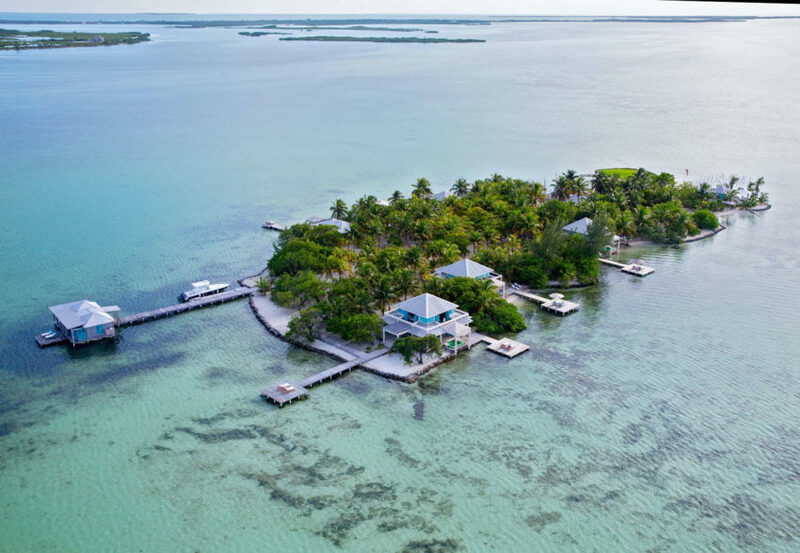 There are few better places in the world to experience than the amazing island of Cayo Espanto, located three miles from San Pedro in the calm waters of the Western Caribbean, off the coast of Belize. Full island rental accommodations include personal butler service for all guests, including 3 tailored meals per day; guest’s favorite snacks; rack bar drinks, beer, sodas, fruit juice, bottled water (drinks exclude wine, dessert wine, champagne and cordials); San Pedro Airport Greeting; Cayo Espanto offers a scheduled, daytime, boat launch to/from San Pedro daily and all non-motorized activities (this includes the use of sea kayaks and sail boat). Full island rental includes all seven ocean front villas, for up to 18 guests.